I want you to take all of the "joy" and "excitement" you had for THE DA VINCI CODE and apply it to Greg Vilk's GOLEM. You will walk away from it saying this: wow. 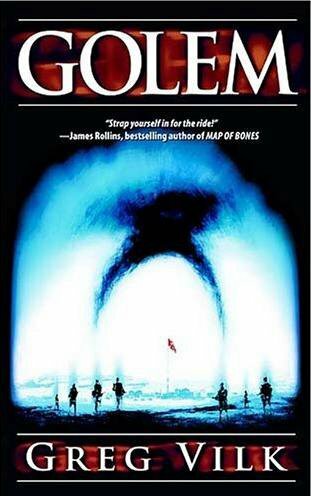 GOLEM takes place during World War II--in Greenland--where a U.S. Rangers unit is deployed to take down a hidden (obviously!) Nazi camp. But when the rangers arrive, they find the Nazis have been slaughtered--all but one, and this lone survivor is telling stories of seeing ghosts in the landscape. Sounds crazy. But is he? What the rangers find is incredibly wild, original and a blast from start to finish. Vilk writes with a language that is rich yet easy to digest, a decided talent. And there is even more fun in the hidden codes. This is a novel you will be recommending to friends and family for some time to come. This book, while self-published and PODed, has already commanded high praise (other than by me, that is) from the likes of bestselling authors James Rollins (SUBTERRANEAN) and Stel Pavlou (DECIPHER). If you can't trust three strong endorsements, what can you trust? Grab this bad boy and hunker down in your favorite chair for a long night! Getting the insider info . . .